The Indigenous People of Biafra (IPOB) has warned the federal government not to provoke it into taking up arms by continually keeping its leader, Nnamdi Kanu. It warned that Kanu must be brought to court Tuesday dead or alive. 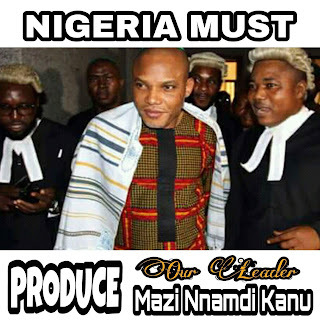 The group added that its angst would be felt if the Nigerian government failed to produce Kanu in court, dead or alive to continue his trial. Recall that Kanu had been granted bail in May under stringent condition, with the order to return to court to face his trial before Justice Binta Nyako. The group in a press release signed by its Publicity Secretary, Mr Emma Powerful, stated that it was gradually losing patience with Nigerian government for keeping its leader, who they alleged was abducted during the invasion of his home in Umuahia, last month. IPOB also condemned the continued denial of the military that Kanu was not with it, citing a recent interview by the Nigerian Defence Minister, General Mansur Dan Ali on Channels Television in which he confirmed that Nigerian Army went in search of Mazi Nnamdi Kanu in his home. The group said this was in total variance with previous statements of the military, where they denied invading Kanu’s home. It noted that since the invasion on 14th September, Kanu and his parents have not been located. “The bare faced lies of the Nigerian Defence Minister General Mansur Dan Ali and that of the Buhari regime against our leader and organisation is beginning to unravel before the eyes of the world. By admitting publicly that soldiers were sent to Isiama Afaraukwu to look for our leader without any order or warrant from a court of law confirms the contempt in which Nigerian government holds the rule of law and their judicial process. The group spoke further that, “It is therefore reasonably expected to conclude that the army is also lying about not having our leader, Mazi Nnamdi Kanu in their custody. It said the struggle for Biafra independence had gone far beyond violence and way beyond the capacity of Nigeria to deal with, and that the dimension its struggle will take going forward depends on what fate Nigeria visited or intend to visit.